Some say the word “carnival” comes from “carne vale”, or “farewell to meat”. I guess that’s one way to look at Shadow Paladin? ACT [V] 1/Turn: [Choose 1 of your rear-guards, and retire it] Your opponent chooses 2 of their rear-guards, and retires them. If your opponent could not retire 2 rear-guards, choose up to 3 of your front-row units, and they get Power +4000 until end of turn. 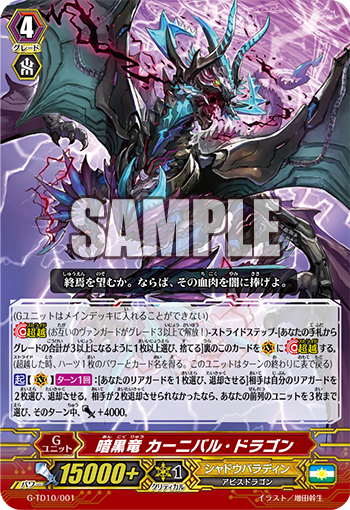 For today’s card we’re introducing the 《Shadow Paladin》 G Unit: “Dark Dragon, Carnival Dragon” included in the Trial Deck “Ritual of Dragon Sorcery” (on sale November 11th, 2016). “Dark Dragon, Carnival Dragon” that has a utility ability. Before starting an attack, it can Retire one of your own ally Rear-guards to Retire your opponent’s Rear-guards!! If your opponent doesn’t Retire 2 of their Units, 3 of your front row Units gain 4000 Power. Regardless of when it Strides, you can expect it to end up doing something! With the cost of Retiring Units and the on Stride Effect of “Dragheart, Luard” which calls 2 Units, you can basically cancel out the demerits of Retiring. Also, in the case of if your opponent only has 1 Rear-guard that can be Retired, its effect is really then “Retire 1 opponent Rear-guard and all of your front row Units gain Power+4000”, so it’s perfectly fine even if you get rid of your opponent’s Rearguards beforehand. The new 《Shadow Paladin》 G Units strengthen your Deck even further! Also, today’s “Weekly Vanguard News Bits NEXT” introduces a GR from “Divine Dragon Caper”, so don’t miss it!